Baskin-Robbin ice cream-inspired coffee flavors are back at Dunkin' Donuts starting Monday, May 28, 2018. Pistachio, Butter Pecan, and Cookie Dough ice cream flavors return for a limited time and can be added to any hot or iced coffee, latte, and macchiato. Baskin-Robbins and Dunkin' Donuts are sister chains under the Dunkin' Brands umbrella. 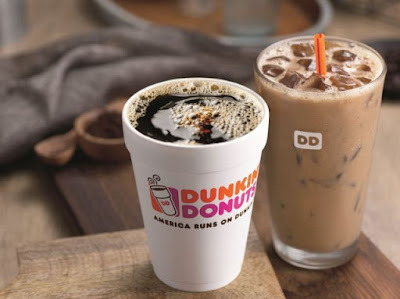 Other ice cream-inspired coffee flavors that Dunkin' has offered in the past include Jamocha Almond Fudge, Mint Chocolate Chip, and Rocky Road.